MI's discipline at the death and where do RCB go from here? Mumbai Indians bounced back from their defeat against Rajasthan Royals on Saturday to beat Royal Challengers Bangalore by five wickets and hand Virat Kohli's side their seventh loss of IPL 2019. After winning the toss, MI elected top bowl and despite fifties from AB de Villiers and Moeen Ali, RCB managed just 171/7 in their 20 overs. In response, MI raced off to a quick start and despite a stutter in the middle, Hardik Pandya's late cameo saw the hosts over the line with an over to spare despite Moeen Ali and Yuzvendra Chahal combining for 4/45 in their eight overs. When Malinga was off to Sri Lanka to play a List-A game after picking up three wickets against CSK, MI went with Alzarri Joseph to replace him. Although Alzarri got off to a dream start, registering the best figures in the IPL on debut, he couldn't quite replace it after that. 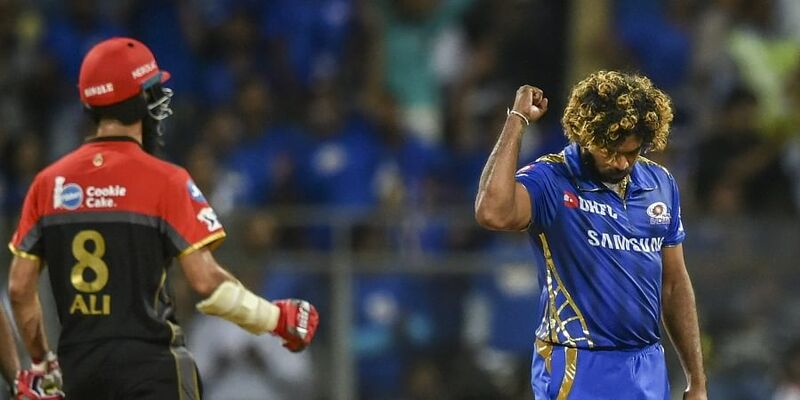 With Alzarri ruled out of the tournament, Malinga came in and showed just why he is the all-time leading wicket-taker in IPL history. Coming in at the death, the Sri Lankan pacer displayed his complete array of tricks and ensured that MI were chasing a below-par total. Malinga finished with figures of 4/31 including the twin strikes of the dangerous Moeen Ali and Marcus Stonis in the 18th over. He capped it off by taking two wickets in the final over as none of the batsmen managed to pick his slower balls. One of the hallmarks of MI this season has been their ability to execute at the death, not just been with the bat but with the ball as well. That was on show against RCB on Monday. After 16 overs, RCB were cruising at 136/2. With two batsmen closing in on a fifty, they looked on course for a total close to 200. But the combination of Bumrah and Malinga executed their plans perfectly at the death. While Bumrah kept the runs down, Malinga picked up the wickets with his slower ones. The duo ensured that RCB got a below-par total and with the bat, it was Hardik Pandya. With 41 needed off the last four overs, the game was still in the balance. But Hardik's 16-ball 37 helped MI get over the line with an over to spare. Where do RCB go from here? After a morale-boosting win on Sunday, RCB came into the game against MI brimming with confidence. And while they were in the contest for much of the game, they couldn't seize the big moments and that cost them. With the bat, it was Akshdeep Nath's refusal to go for the second when AB de Villiers was on fire, which resulted in the South African getting run-out. With the ball, it was Pawan Negi, who couldn't execute on a pitch that was offering plenty of assistance for spinners. While Chahal and Moeen finished with figures 4/45 in their eight overs, Negi alone went for 47 in his four overs, including 22 in the 19th over. All of that now means that RCB becomes just the fourth team after KKR (2009), KXIP (2010) and DC (2013) to lose seven of their first eight games.